Hello everyone! Today, I’m excited to share a contest and event that I’m a part of with Vaughan Mills. I love getting a good deal, and Vaughan Mills is one of the best places to score a pair of Nikes on sale, find cute jewelry at J. Crew or scour through Winners and HR2 for the best designer deals. 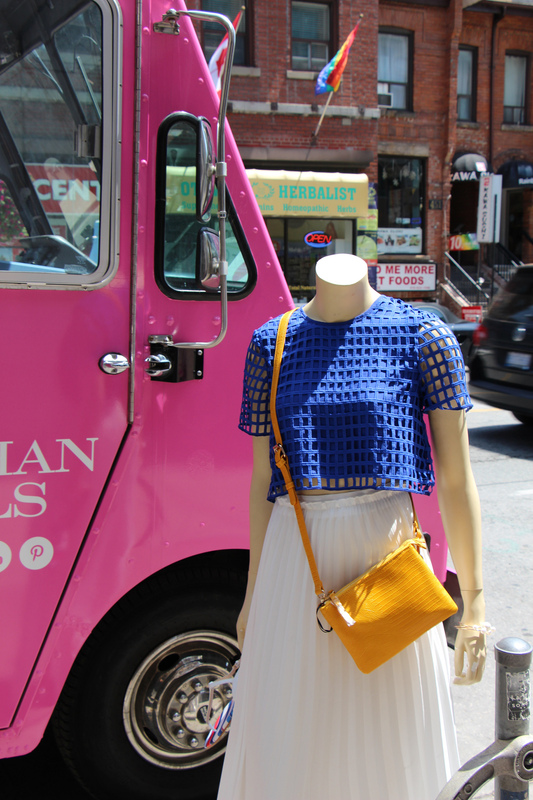 I jumped at the chance to style an outfit and be a part of the Vaughan Mills Fashion Truck which has been giving out ice cream and prizes all around the city this week! I styled an outfit for the van and was inspired by the De Stijl Dutch art movement. As you may know, I lived in Utrecht, Netherlands a couple years ago and had a chance to visit a De Stijl style house. Living there changed my life and I have always been inspired by the minimalism and primary colours of this style. My outfit was inspired by Mondrian, and I paired a cobalt blue crop top with a sheer pleated white skirt, both from HR2. I love the way the top has a really cool grid lace overlay, a completely unique detail! Next, I paired a vegan leather yellow purse, which reminded me of a Celine Trio bag at a fraction of the cost! I love the pop of the yellow against the blue. Lastly, I added pearl bracelets from H&M and Nine West white sandals for a cool vibe. This outfit would work great at a resort or for dinner by the water. There’s also other picks by four other fashion bloggers, I loved seeing what they found at Vaughan Mills and how they injected their personal style into the picks! If you pass by the Vaughan Mills Fashion Truck you can stop by and get a free ice cream if you Tweet #TreatTheHeat! You can also enter to win great prizes valued at $250, by tweeting @vaughan_mills and tagging the blogger’s giveaway pick. For my giveaway pick, I chose a pair of mirrored Ray-Ban aviators. These are a contemporary classic that would add some glamour to your summer wardrobe! Be sure to follow Vaughan Mills on Twitter to get updates on where the fashion truck will be, trust me, you won’t want to miss out on these sweet summer prizes! I love the idea of a fashion trunk. Style on wheels. So cool! There’s a truck like this cruising around Calgary this summer too. i love the idea of mobile promotions… gets the word out, and the goodies to more ppl around the city! Enjoy summer in Calgary, did you visit the Stampede?